The Fire Hose Carrier aka the Aqua Blaster, is a harness frame that combines a fire hose and firefighting nozzle. It allows the user to have enhanced control of a charged fire hose line and nozzle with minimal strain and stress on the body. The harness frame of the Aqua Blaster is constructed and designed identical to some of the percussion marching drum carriers that are worn and used by drummers in marching bands to carry, balance, and support the weight of their drums while performing. The harness frame allows the user to use his/her torso area and the strength of his/her legs for leverage making it much easier to maneuver and or advance the fire hose line whether being assisted or completely unassisted. The flow control aspect or component of the Aqua Blaster is two continuous elbow swivels on opposite ends of a pipe or tube that are attached or mounted on the belly plate of the harness frame. The elbows attach the fire hose and nozzle positioning the fire hose at the user’s side and the fire nozzle in the front and center of the torso. Both elbows have the capacity to rotate or swivel at 360 degrees allowing the fire nozzle to pivot up and down when in use and allowing the fire hose to be maneuvered more easily. A locking device is constructed on the Aqua Blaster for the fire nozzle elbow providing the option of locking the fire nozzle at a desired angle or position when or when not in use. This also allows the hands to be free to carry out and accomplish an additional task if needed and even allows a charged fire nozzle to be in operation hands free. The Aqua Blaster can be used with various agents like water, foam concentrates, and gels that are presently being used with the fire hoses to carry out specific tasks. The Aqua Blaster would be an asset to the multiple industries and users of fire hoses and fire nozzles. It provides a new and alternative way that the fire hoses and nozzles can be used. In some situations, it actually makes the use of a fire hose and nozzle safer and more efficient in accomplishing the task at hand. The Aqua Blaster can be used in many aspects of firefighting such as wildland, volunteer fire departments, airports, on ships including military branches like the navy. Many volunteer fire departments have limited resources and equipment. The Aqua Blaster will allow one volunteer firefighter to respond to a call in rural areas with limited manpower. 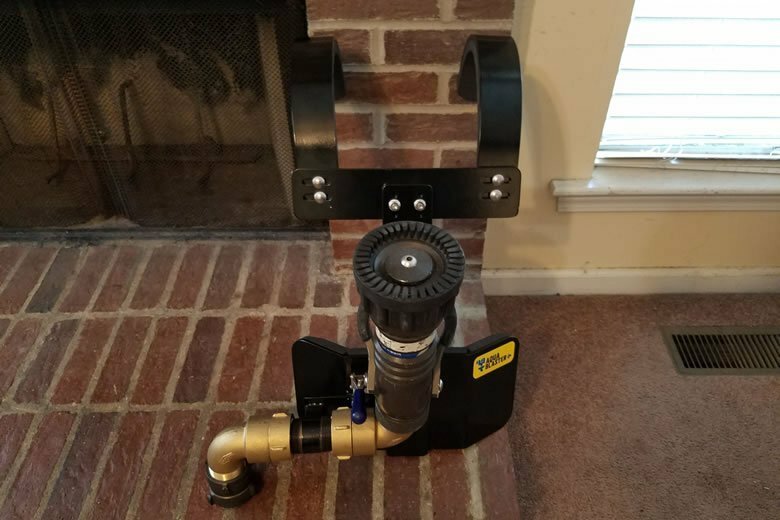 The Aqua Blaster can also be used by private citizens with home firefighting systems that consist of poolside fire hose pumps that are used to fight residential fires. The Aqua Blaster can also be beneficial with certain aspects of power washing. Fire hoses are used in the mining industry. Fire hoses are used on above ground wash pads to clean off road equipment. Fire hoses are used for dust control to suppress dust and debris during construction demolitions of structures. During oil spills on beaches and shore lines, fire hoses are often used to break up the oil to be secured in booms so that the oil can be gathered and disposed of in a safe manner. In both the government and private sectors, the use of fire hoses and fire nozzles has infiltrated the way we do jobs in a variety of ways to save lives and preserve our environment. The Aqua Blaster is a revolutionary and simple concept that has combined a fire hose and a nozzle in a way that will allow them to be used in an innovative way that enhances productivity in how we perform our jobs that will aid in possibly preventing injuries, allowing these jobs to be accomplished in less time. Some firefighters and others who use fire hoses may be able to prolong their careers as a result of using the Aqua Blaster.